The big news for Timber to Table in 2017 was bringing Dark Timber Outfitters into the fold. 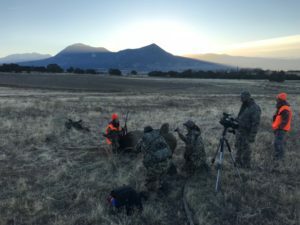 A previously existing operation located on the Uncompahgre Plateau, the acquisition of these permits, along with Dark Timber Lodge, allow us to now outfit early season hunts (archery, muzzleloader, 1st and 2nd rifle seasons) as well as our late season hunts that run into December. Our new permitted area consists of 100% public land in Units 61 and 62. It’s some beautiful and classic elk country. We had several hunts with Dark Timber in 2017 and we’re already booking up for the 2018 season. We’re very excited about the opportunities this will give our hunters. We’ll keep the name of Dark Timber Outfitters for our early season hunts and you can find the web page at www.darktimberlodge.com. The late season was a strange one. While we had elk around, they never really showed up with any consistency. The weather was extremely warm, no snow came and therefore the elk never really had to move down from the high country. As I write this, they are still way up high. I’ve never seen such unpredictable behavior in the elk. Some mornings there’d be 40 or more down. Then nothing for days and days, then a couple dozen would hang around. Then nothing. Not the normal numbers we have and they would head up early…almost right at legal shooting light. This made the hunts pretty challenging. Despite this, we had several close calls with a couple new hunters and a very successful hunt with participants from the CLfT program. CLfT is short for Conservation Leaders for Tomorrow. They’re an outstanding organization that brings current and future wildlife managers unfamiliar with hunting and firearms into the world of hunting through a very educational, supportive and ethical experience. While it seems counterintuitive, many folks working for state agencies who are making management decisions for our wildlife don’t hunt, never have and may not ever try it. Fortunately, organizations like CLfT exist to help address this. 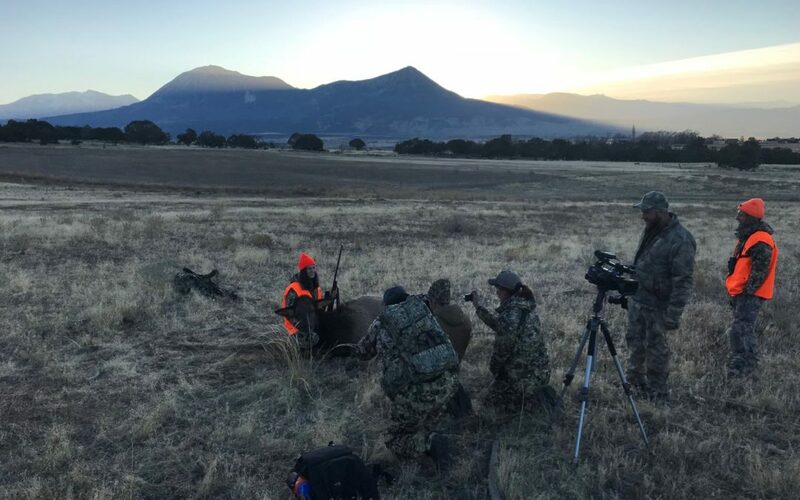 We were lucky enough to host a couple CLfT participants, their mentors and even a camera crew from the Rocky Mountain Elk Foundation. 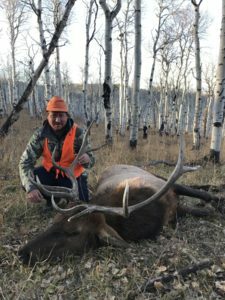 The RMEF sponsored the hunt and really allowed this experience to happen for the two hunters. 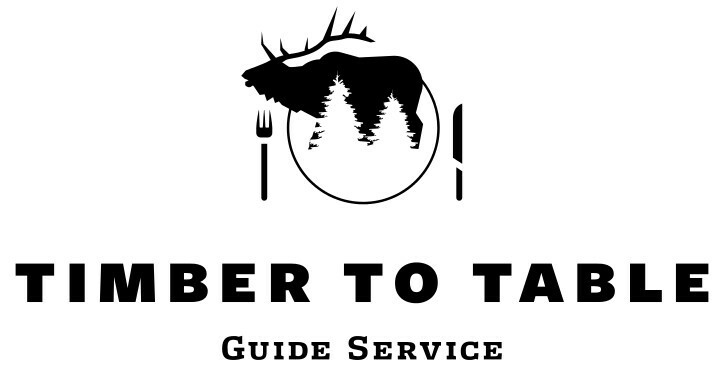 Creating a partnership with two amazing organizations like the RMEF and CLfT fits in with our mission at Timber to Table about as perfectly as we could ask for. We’re looking forward to having another great hunt with CLfT and the RMEF again in the late season of 2018. It’s looking like the upcoming 2018 seasons (Timber to Table’s 3rd and Dark Timber’s 2nd) will definitely be our biggest year so far. As always, we’re still 100% committed to providing an exceptional hunting experience that focuses on educating our new hunters about the animals we hunt, the public lands we all share and the wonderful food we are blessed with if the hunting gods smile on us. Many memories were made in 2017 and 2018 will surely bring more!